Nature Shades 32 oz Southern Pine and Autumn Pine Colorants: Covers 2500 SF on new Pine Straw and with proper water:colorant ratio. Refer to the back of the jug for ratio information. This product is to be applied with a pump sprayer or a spray rig. (It is advised to clean out the sprayer/rig after use to avoid clogging.) Shake before use. Please let us know if you have any questions about the product. We also have 16oz, 1gal and 2.5gal jugs available for purchase. 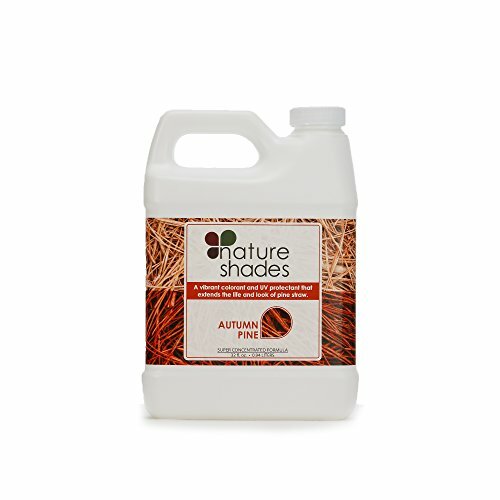 Nature Shades Pine Straw Colorants are specifically formulated to enhance the color of new or old Pine Straw for up to 9 months. Our Colorant is created with the latest and greatest pigment technology. Premium binders and surfactants add UV protection and ensure that your colored Pine Straw stays bolder, longer: Absorption: Mulch is a very porous material and absorbs product easily. Pine straw on the other hand is naturally resinous and resists typical Pine Straw colorants. Our pine straw formulations have superior binders that help hold the product to the pine needles. UV protection: Pine straw is by nature, less structurally competent and decomposes faster than mulch. Our colorants reduce the amount of UV penetration to the straw, this extends the life of the pine straw and provides bolder longer lasting color. Application Procedure: Application to pine straw is typically achieved through topical spraying, after the straw has been laid. This allows us to use a unique binder package that not only helps the color bond to the straw, but the straw bond to itself. This holds straw in place longer and reduces impact from leaf blowers, walking traffic and other mechanical interference.